Bug Balls are an innovative and all natural product that is easy to use and offers a safer solution to using harmful pesticides for insect and odor control. Did you know that research has shown Geraniol to be an effective plant-based mosquito repellent? It is also the primary part of Citronella Oil. 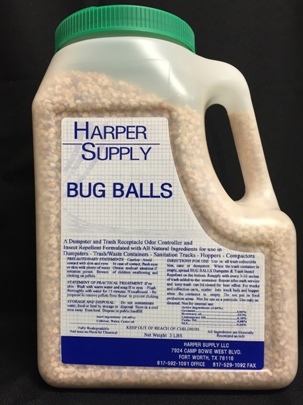 It’s no surprise that combined with the other all- natural ingredients in Harper Supply’s Bug Balls, that this Deet free blend is excellent at repelling mosquitoes, flies, gnats, no seeums and flees.